“I’d say this work chose me,” Cheryl Merz says of her ability to see dead people … and talk to them. A transplant from western New York state, she’s worked as a psychic in Utah for the past 15 years. After studying mediumship with the spiritualists in Lily Dale, N.Y., along with a variety of mentors and guides (both in human and spirit form), Merz continues the tradition of mysticism practiced by her grandmother and great-grandmother. Mysticism was a foundational belief for them, she says, “not a sensational, unusual or accidental occurrence.” When not chatting with departed spirits, you might catch Merz at an art show or concert with City Weekly’s Doug Kruithof (who doesn’t see dead people but is known for bringing dead advertising budgets back to life). Her website is EnchantedEye.com. What are your psychic/medium skills? I’m a psychic and a psychic medium. A psychic is somebody generally who uses their intuition and feelings. As a medium, I get visions, feelings, sensations in my body. I smell things, I call them “downloads”—it will be like a whole feature film that drops into my energetic field of vision, in less than eight seconds. 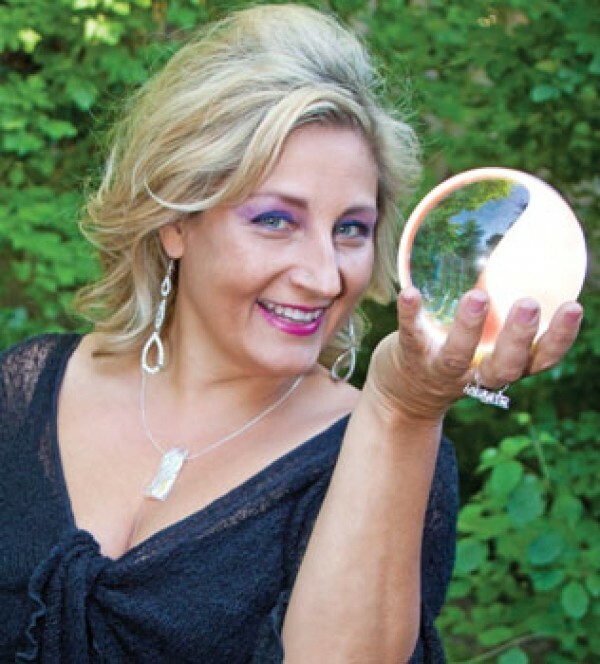 Being a psychic medium means that I connect with energy or people who’ve crossed over who now live in spirit form who are around to help. The focus of all of my work is clarity. It’s wholeness, it’s understanding your purpose for being here, and then my job is just to help my client get there in the most pain-free process. How do spirits communicate with you? Spirits bring clues. There are clues that a spirit will give you. So, say, you and your grandmother, when you were a kid, used to play a certain card game. And if you came and sat down with me, I won’t understand it, but the Old Maid card will show up, and I’ll tell you. “I see this Old Maid card, a young girl, and I see a copper teapot.” The spirit will give me some visual cues that I can describe to you that say we’re on the same page. It brings along certain symbolism that makes sense to the person I’m sitting with. That helps to confirm that they’re there. Once we work through that, then they answer a specific question and again will bring in clues that are obvious that the two of them are connected, that I would have no idea about unless I was talking to one or both the spirit and the person that’s sitting with me in the reading. There’s always been that connection, my whole life. And I’ve learned over the years to just take my filter out of it. How is seeing a psychic different from seeing a therapist? My belief is that we’re always led to the help that we need. We’re led to the right source of information. There’s no right or wrong. For some people, it makes sense to go to a therapist. The language and the process makes sense to them, it helps them. For other people, there’s some intrigue with the mystical aspect of psychics. But the reality is that what I do hones in on the problem. When I sit down to do a reading with somebody, a lot of times I’ll do a general check-in with them, and I’ll hit on things that are on their punch list without even knowing that it is. It’s just another way of getting help and getting answers and getting guidance. There’s no better way or right way or wrong way, it’s just what makes the most sense to you. Why is there a need for psychics? I think there’s a warmth, there’s a groundedness. There’s an approachability or an accessibility that psychics have as opposed to medical professionals. Medical professionals are people—I don’t want to judge it. Psychics are like, “I’m an everyday person, I get your problems, and I get what the issue is, and I just want to help you get through it and get on with your life.” I have my training, but I don’t have a protocol outside of what I do and how I do my business. I’m happy for people to go and learn more about themselves and understand the world they live in a little bit more and reconnect with their drives and their passion. Taking some action is great.